I am rounding out my blogging streak as part of the Blogember blog every day in November challenge, and I feel ready to start a new kind of streak, a running streak! 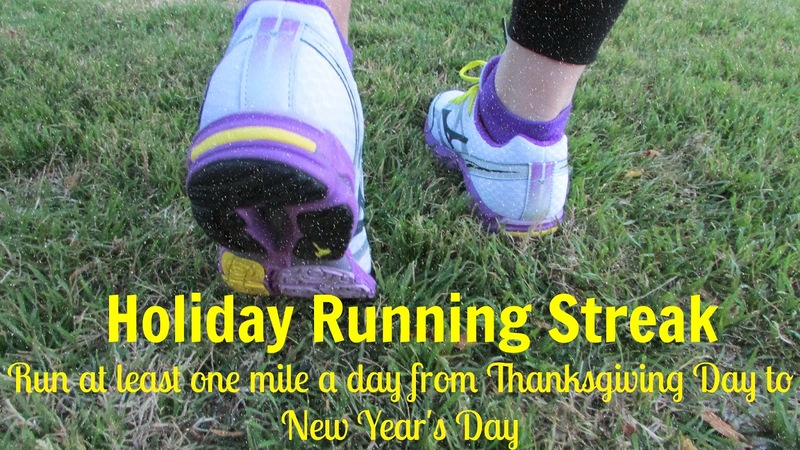 Runner's World hosts a holiday running streak every year and the idea is to pledge to run at least one mile every day from Thanksgiving Day to New Year's Day. I have a little experience in streaking (the run kind, of course), both successful and unsuccessful. In 2012 Hubby and I ran every single day from Jan 1st through October 11. What happened on October 12th you ask? Well, it was hubbies 40th birthday and we, um...forgot. The streak was broken. Last holiday I attempted the Runner's World streaking challenge from Thanksgiving to New Year's Day and I didn't complete it. This year I want to redeem myself and successfully complete the holiday streak. The idea is to challenge yourself to get out and get moving and to get in the habit of lacing up those shoes every single day. If you are a regular runner, you will run your normal days, but then on your regular rest days, just do one easy slow mile. If want to get a jump on your new year's resolutions and you are using this run streak challenge as way to start running and get healthy, then just start with a one mile jog/walk every day. Run slowly, take it one mile, one day at a time. Build up the mileage slowly as you are able. There is no shame in a walk break. You'll be amazed at what you will be able to do by January 1st. 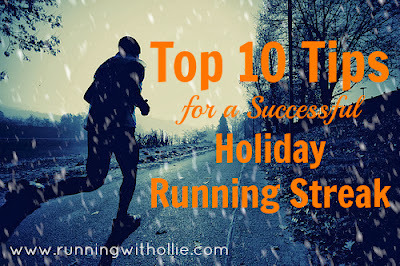 Since I have both completed run streaks successfully and unsuccessfully, I will give you my 10 best tips for completing the Runner's World holiday run streak. 1. Tell your friends and family your commitment to complete the challenge. If you tell people about your plans, you may feel a bigger obligation to follow through. 2. If possible, find a streaking partner. When Hubby and I did it together, we helped motivate each other, but don't feel discouraged if you are going at it alone, it just goes to shows your dedication. Besides, there is a whole online community completing this challenge, you can find your support online. 3. Having access to a treadmill is helpful on rainy or extremely cold temperatures, but then again, hubby and I did a mile or two in the rain on our streak! Be prepared to bundle up! No treadmill necessary. 5. Although this is technically against the Runner's World rules of the streak, I think it is OK to walk your mile for the day. We walked plenty of our miles during our 2012 streak. I say a mile is a mile and sometimes you need the rest. Your challenge. Your body. Your rules! 6. I found that getting the run done early in the day was the easiest way to stay consistent. Those miles Hubby and I did rushed at 11:30pm just to keep the streak alive were not the best. Depending on how fast you run or walk, one mile will take an average 8-20 minutes. Even when I am super busy, I can usually find this small amount of time. Sometimes it just means getting up a few minutes earlier. 7. As the streak goes on, you'll find it becomes a habit and you will really want to squeeze in your mile, by any means possible. Stay with it, after a couple of weeks it will become second nature. 8. Join the other holiday streakers on Twitter with the hashtag #RWrunstreak. Post about your daily miles on Twitter, Facebook or Instagram and read about other runners completing the challenge. There is nothing like thousands of like-minded people in an online community to let you know you are not alone! 9. Use the challenge to motivate yourself to stay active through out the holidays, but if you miss a day it's no reason to quit, just pick back up where you left off. I planned on getting my Thanksgiving Day miles in at the turkey trot yesterday, but since that didn't quite work out as planned, I ran a few miles in the neighborhood later that morning to start off my streak. I am excited about using the streak to stay motivated to run this holiday season. Are you streaking? How do you stay motivated? Only a few days left to enter my Runner's Holiday Gift Guide mega giveaway. Click over to enter today. Not "streaking" but for the first time trying to keep running during the winter. So far so good! Yay for the streak! I'm doing it this year too, it's my first one. Good luck! No streaking for me this year. I've done them in the past and will probably regret not doing it this year.